After spring and summer, the majority of birds in Michigan leave for the south. Their instincts pull them to return to wherever they have a full diet of insects and fruits. Those winter birds that stay for the colder months are marvels at finding food. What can they possibly eat? How do they find food? 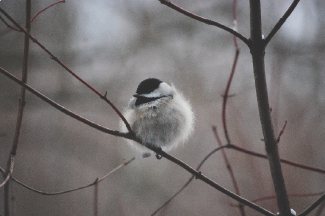 Whenever I hear the calls of Chickadees in winter, their “dee dees” catching my attention, I know to look for them if I want to locate other winter birds. The Chickadees are what I call the “Flock Masters”. Very hardy and inquisitive, they are usually the first to locate a food source, whether natural foods or those found at feeders. Other birds are keen to the Chickadees’ ability to find food. Downy Woodpeckers, Tufted Titmice, White-breasted Nuthatches and Brown Creepers make up the companion group that follow Black-capped Chickadees as they forage for food. Even those birds that come to our feeders for sunflower, suet and peanuts will continue to forage for natural foods. They eat what protein they can find, including insect eggs and cocoons, in addition to the insects hidden within the trees. They perform a great service as they keep our trees healthy and strong. Working on the tiny twigs of the trees is the smallest of the team, the Black-capped Chickadee. The ability to hang upside down and investigate with their sharp eyesight and small, probing beaks enables them to find the eggs and hiding insects on the smallest of twigs. 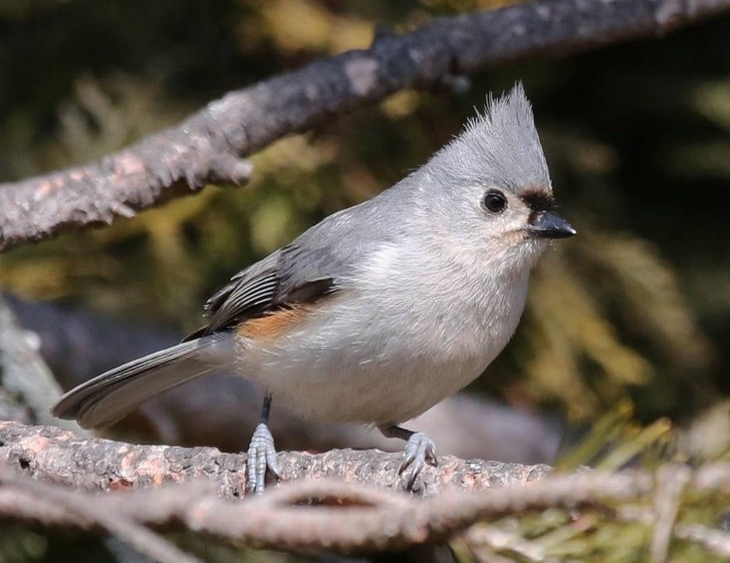 The Tufted Titmouse, a cousin to the Black-capped Chickadee, is a little larger and can focus its energy on the larger twigs. They work more slowly and usually move around in mated pairs. Their comparatively louder calls ring out clearly in the winter time, as “Peter, Peter” or “Cheer, Cheer, Cheer.” Titmice are also adept at hanging on to branches in an acrobatic manner. Sometimes when they are very intent on their food gathering, their head crest will remain down. At other times, the feathers of their crest become erect as a warning. Perhaps they feel a hawk is in the area or a squirrel is getting too close to their food source and they do not want to share. The Downy Woodpecker is an even larger bird in the team of Winter Tree Birds. They work on the limbs and larger branches of the tree. Not only do they look for insects, eggs and cocoons on the branches of the trees, they listen for the sound of insects moving inside the trees. 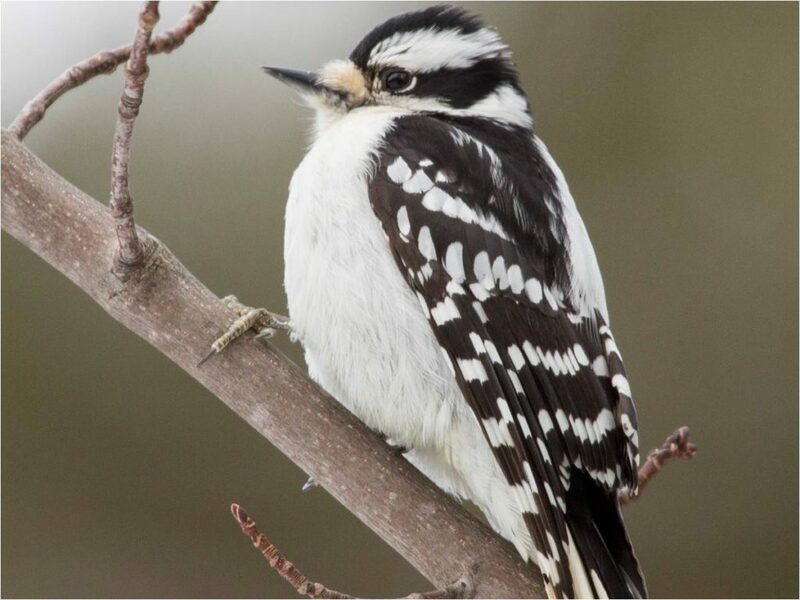 This is why you may watch a Downy Woodpecker clinging to the side of the tree, moving its head from side to side – it is listening for the insects. Once it locates them, it uses its small beak to chisel a hole and extract the insects inside. A woodpecker has special tools for this function, a barbed tongue with sticky saliva that is excellent for extracting the insects it finds. The deep cracks in the bark of some trees are a perfect place to find cocoons, insects, and eggs, sheltered from rain and snow. This is where the White-breasted Nuthatch and Brown Creeper are very adept – their beaks well-suited to the job. White-breasted Nuthatches have a thin dagger-like bill that is slightly upturned on the bottom edge to create an angle, perfect for the type of feeding it does. 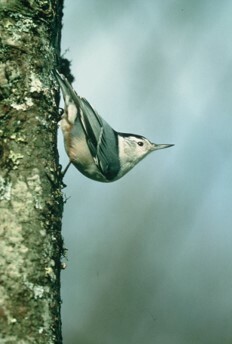 When seeking food, the Nuthatch travels upside down and from top to bottom on the tree trunks. This allows them to find the food the right-side-up birds do not see. 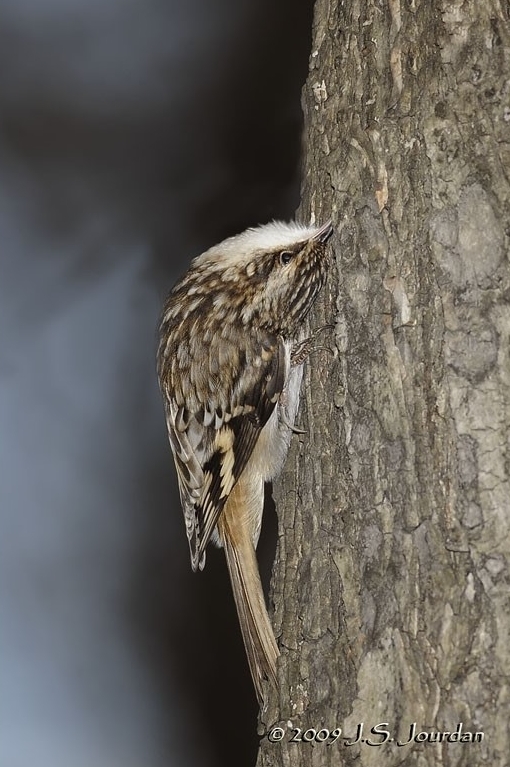 On the other end of the spectrum is the Brown Creeper, who can be identified by its behaviors. 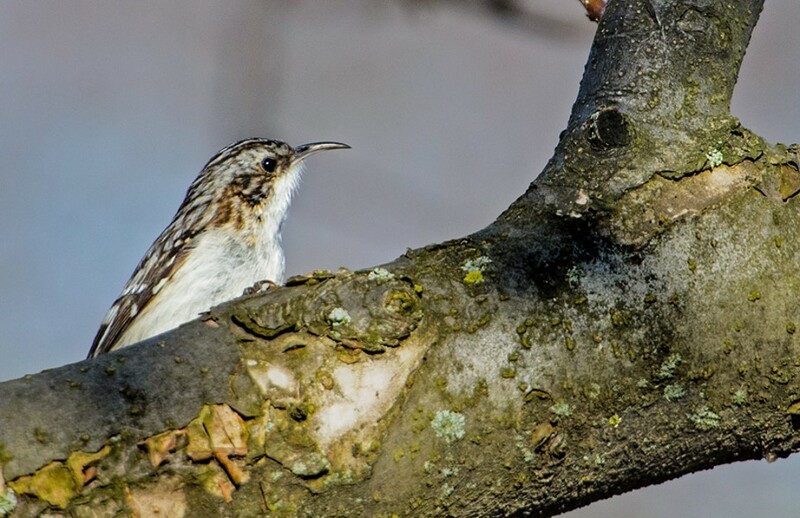 Flying from one tree to another, the Brown Creeper lands at the base of the tree and work its way up, searching along the bark for food, and circling the tree as it climbs. Its long, needle-like bill allows for deep probing within the nooks and crannies of trees. This bird eats only insects in the winter – an admirable accomplishment. The Black-capped Chickadee takes care of the tiny twigs, the Tufted Titmouse gleans from the larger twigs, the Downy Woodpecker from limbs and branches and the White-breasted Nuthatch and Brown Creeper take from the trunks and larger branches of the trees, travelling in opposite directions. By working as a team, these five species of birds help to keep our trees healthy and strong.